I greased a bundt pan. 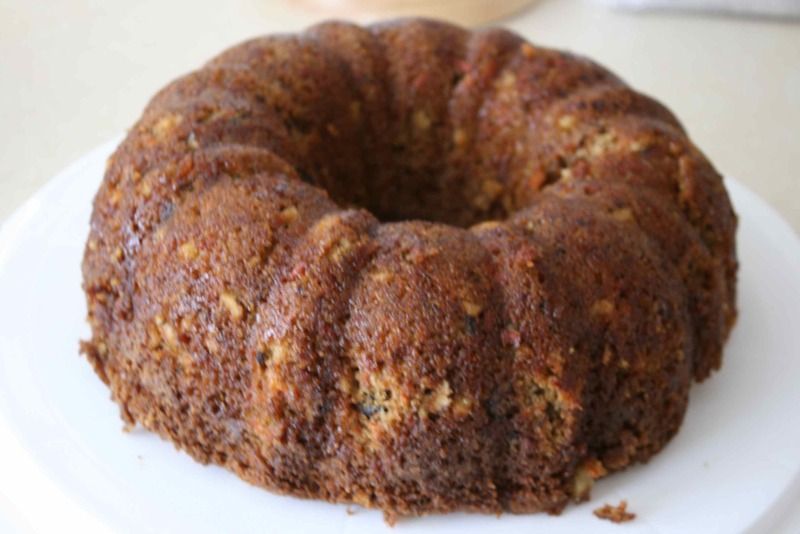 I like to bake cakes in bundt pans because it makes for a prettier and fancier presentation without any extra work. Problem is, I didn’t grease it enough, and I probably should have floured it too. I’ll remember that next time. The cake cracked a bit when I took it out. Still looked and tasted great, though. 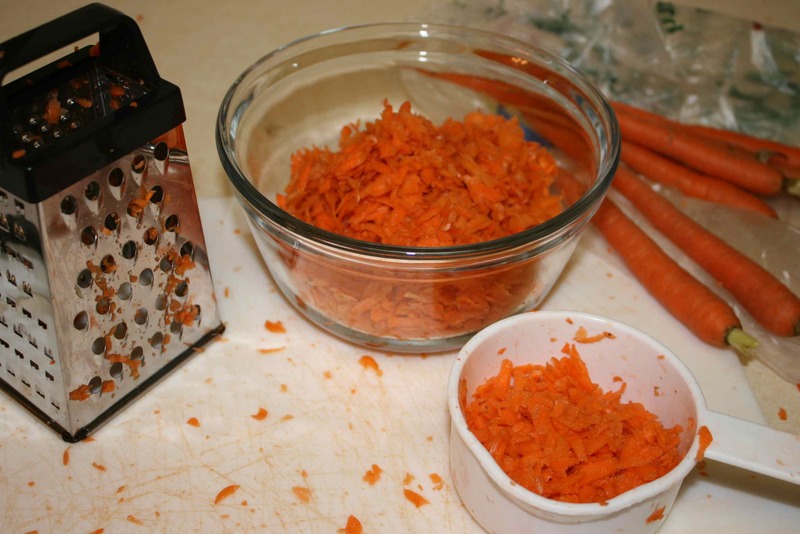 I first set about grating 2 bunches of carrots. It took quite some time, but was kind of fun. 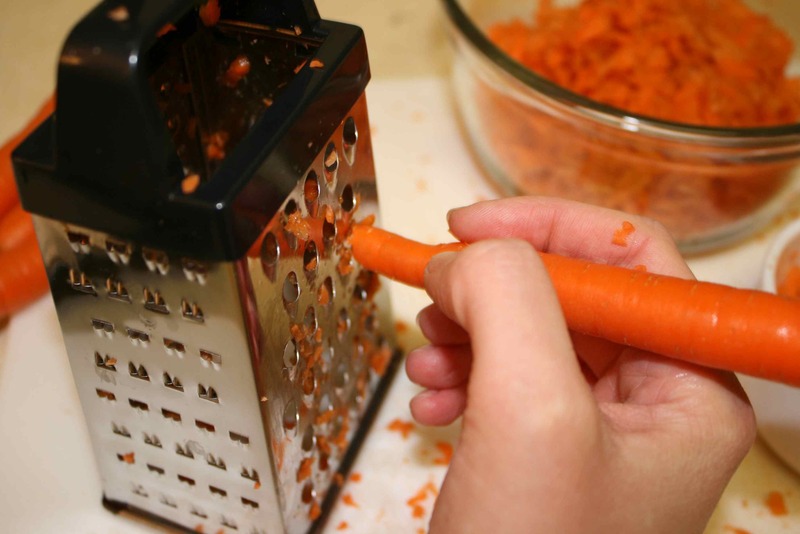 Hold the carrot like a pencil at an angle to the grater and work at it until you get a wide, flat carrot end to work with. Then it’s easy to grate it from there. 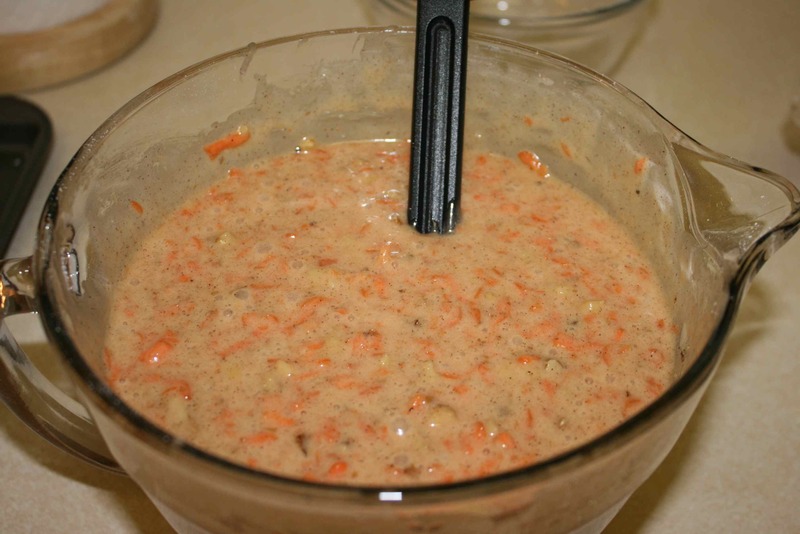 2 bunches of carrot turned into almost 4 cups of grated carrots, which is what the recipe called for. I probably could have used a couple extra carrots — they were a little puny, being winter and all — but it was good enough. I also went ahead and chopped up 1 cup of walnuts. Here’s a little tip for chopping nuts: Instead of making a mess by dumping them on a cutting board and trying to chop them with my horrendous knife skills, I sealed them in a zippered plastic bag and beat the hell out of them with a soup can. 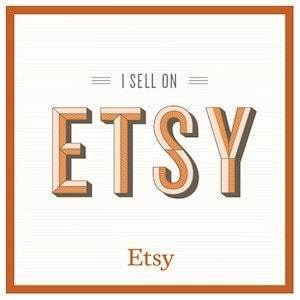 It chops up the nuts pretty well and is pretty fun in an anger- and stress-relief sort of way. I whisked together 2 cups of all-purpose flour, 2 teaspoons of baking powder, 2 teaspoons of baking soda, 1/2 teaspoon of salt, and 2 teaspoons of ground cinnamon. The recipe said to sift them, but as I’ve said about sifting before, it’s boring and takes too long. 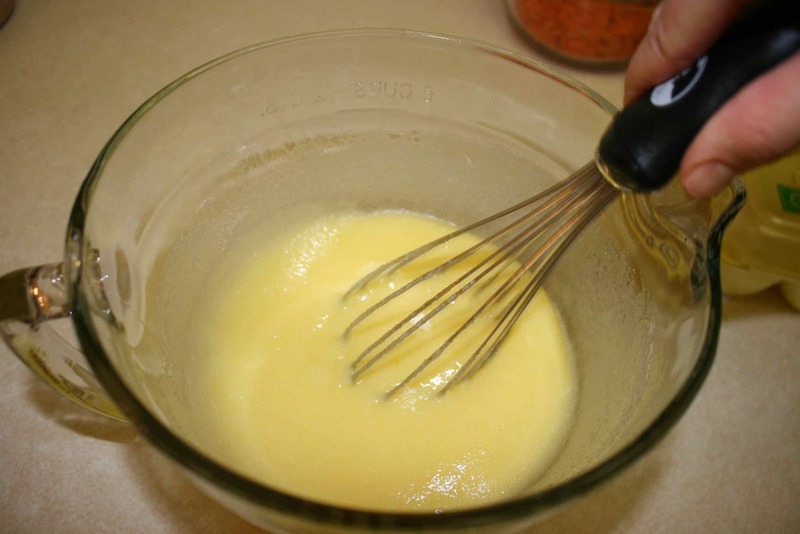 Whisking is good enough. In another bowl, I whisked together 2 cups of white sugar and 4 eggs until it got thick and pale in color. Then I stirred in 1 cup of vegetable oil and then mixed in the dry ingredients on low a little at a time. I folded in the grated carrots and the chopped nuts. After it was all mixed up, I poured it into the bundt pan and made sure it was spread evenly. I popped it in the oven for somewhere between 40 and 45 minutes. I took the waiting time to clean the carrot bits off the kitchen floor, and then I took a shower, since I found carrot bits in my hair. Once a toothpick came out of the cake clean, I pulled the cake out. I flipped it onto my cake carrier pan and let it cool overnight — it was getting late. 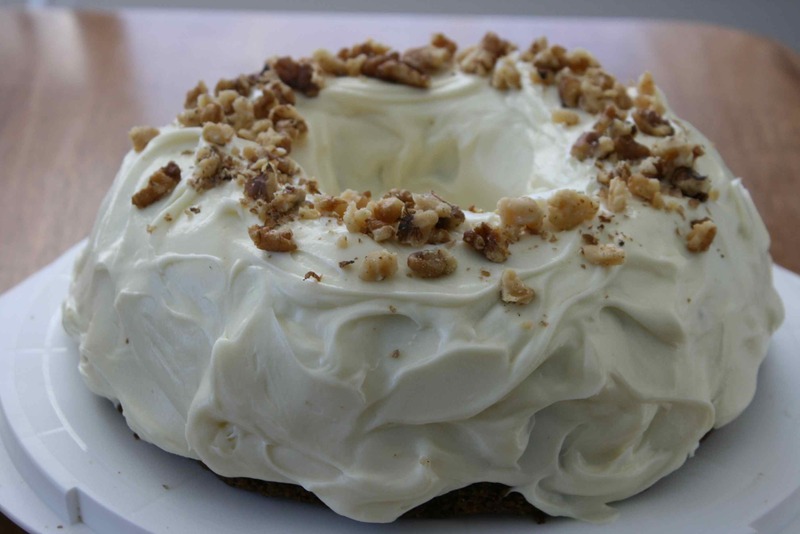 The next morning, I whipped up some cream cheese icing and covered the entire cake. I topped it off with some more walnut pieces. – Grate the carrots before you turn the oven on. It takes a while. Also, if you’re going to make a carrot cake from scratch, take the time to grate the carrots. Otherwise, just use a box mix. If you try to use pre-shredded carrots, the kind you can buy a bag of, the carrot chunks will be too big. – If your cake breaks, just put it back together and frost it — no one will notice. When someone goes to cut or move the cake, you can pretend that it cracked in transport, or that they did it. (Hopefully my friend Cathy, the recipient of this cake, isn’t reading this right now.) To avoid this problem, make sure you grease and flour the cake pan really well, even if you’re using a nonstick pan. Better safe than sorry. – If I plan to frost a cake, I like to go ahead and put the cake on the platter I will serve from, and frost it from there. It’s nearly impossible to move a frosted cake without messing it up. – It’s a good idea to put something on top of a dish that represents what’s inside it — in this case, the walnuts. It not only gives people a clue of what they’re cutting into, but it also serves as a warning that there are nuts inside — really important when nut allergies are so widespread and can be severe. Similarly, I’ll top a quiche or something like that with a few bacon crumbles so that it’s very obvious it’s not a vegetarian dish. – This cake is deelish — sweet and very moist. I wouldn’t recommend it, but if you’re counting calories, you can always substitute apple sauce for vegetable oil.